The Chinese Shar-Pei is an ancient breed that is believed to have been present during the Han Dynasty in China over 2,000 years ago. Despite the breeds long history of living alongside humans, little is known about the modern history of the Chinese Shar-Pei. The first Shar-Pei was brought to the United States in 1966, and within two decades had become popular. The name Shar-Pei translates loosely to “rough, sandy coat.” Although the coat is coarse, the most distinctive feature of the Shar-Pei is the skin folds that cover their body, giving them a unique and sought-after look. The Shar-Pei was first recognized by the AKC in 1992, at which time there were nearly 30,000 of the breed residing in the United States. The Chinese Shar-Pei has a dignified, regal bearing that infuses their personality. This breed is generally quiet, sometimes aloof, and reserved with strangers. They do have a notable history of aggression towards other dogs, particularly when strange dogs invade their space. 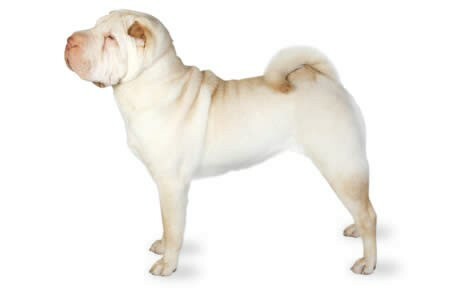 The Shar-Pei needs early and consistent training, and they can be extremely challenging for first-time owners. They respond best to positive reinforcement training, and owners will get the best results with food rewards. Chinese Shar-Peis should also be socialized from a young age with strangers and children. This is a very powerful breed with a history of use as a fighting dog. Shar-Pei’s have a low aggression threshold, so early dominance training and socialization are critically important with this breed. The Shar-Pei is a medium energy breed that will need daily exercise. This can take the form of a long walk, a play session, or extended training. Chinese Shar-Peis live anywhere between 8-12 years. The Chinese Shar-Pei is currently the 61st most popular AKC registered breed. Shar-Peis thrive on a high-quality diet that fulfills their complete nutritional needs. This breed will not do well with low-quality food that contains grain fillers. Shar-Peis weigh between 60-80 lbs., so expect to feed an average sized Shar-Pei between 3-4 cups of dry food a day, split into two even meals. Many Shar-Pei dogs are known to be resistant to grooming, and can sometimes act out with aggression when their ears are cleaned and their nails are trimmed. It is incredibly important that grooming regimens are begun from a very young age to avoid this type of behavior. Luckily, Shar-Peis have relatively low grooming requirements. However, their ears will regularly need to be checked and cleaned to avoid infection, and their nails will need to be kept trim as well. Owners will also need to clean their dog’s lip folds daily, and regularly check their pups skin and skin folds on a regular basis. Are Chinese Shar-Peis Good With Kids? Shar-Peis are recommended with older children only. Children should be taught to respect the power and unique personality of the Shar-Pei. Entropian eyelids are a condition where the eyelid rolls inward. This allows the hair around the eye and on the eyelash to come in contact with the cornea. In mild cases, this will result in excessive tearing, irritation of the eye, and general discomfort. In more serious cases, the abrasion of the hair along the cornea can result in permanent damage to the cornea. Entropian eyelids are a very common condition in Shar-Peis and are generally treated by suturing or tacking the eyelid to ensure that it rolls outward. Cherry eye in dogs is a protrusion of the gland within the third eyelid of a Shar-Pei. This eyelid resides directly against the eye, providing lubrication and protection. If the gland in the third eyelid is exposed, it can quickly become irritated and inflamed. This results in redness, hence the name “cherry eye.” In some cases, cherry eye can be treated using medication, although in more serious cases surgical intervention may be necessary. Canine hypothyroidism is a common condition in Shar-Pei’s and is seen in a number of other dog breeds. This condition is characterized by an underactive thyroid that fails to produce enough hormones to properly regulate metabolic activity. Common signs of hypothyroidism are low energy levels, weight gain, susceptibility to cold weather, and skin issues that mimic other canine skin conditions. This condition is generally treated with hormone replacement therapy. The structure of the Shar-Pei’s ear makes them very susceptible to developing canine ear infections. Their ears are structured in a way that inhibits the flow of air to the ear, allowing moisture to build up and bacteria to form. Common signs of an ear infection include a yellow or brown discharge and a distinct odor. You may also notice your Shar-Pei scratching at his ear or shaking his head. Because this breed is prone towards developing this condition, it is important that regularly checking and cleaning your Shar-Pei’s ears is part of your grooming regimen. And while there’s no telling just how much more time we have with Honey, it warms our heart to know that her final days here have been filled with joy and happiness. Thank you Canna-Pet.